A early pioneer of the “Internet amp demo,” Bob has been recording demos for amplifier manufacturers since 1998, with many of them withstanding the test of time as benchmarks of “good tone” and remaining on the manufacturer websites to this day. 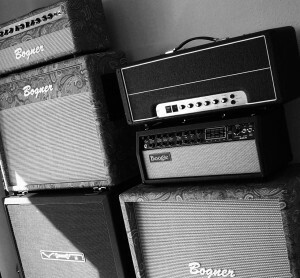 Bob’s approach to these demos is based upon the foundation that the electric guitar is one of multiple instruments that make up a rock band so emphasis is placed on hearing how these amplifiers and guitars sound in a full mix, whereas many demos found online provide only what you hear with the guitar as a solo instrument. The practice of close micing is great for capturing the sound of the amplifier coming directly out of the speaker, however, it also produces a very dry sound since no reverberation or delay from the room can be captured. As a result, while these demos provide the direct, unaltered (no EQ/Compression) tone coming from the amp, reverb and/or delay may be added to introduce the natural sounds that occur in a room/hall. All that’s to say, there is no “studio magic” in these demos.